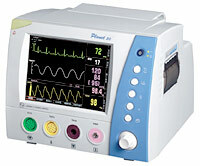 We have a wide range of patient monitoring equipment to ensure safety during and after surgery. These are used during/after surgery and monitor the following patient parameters continuously. They add a great degree of safety during the surgery as well as in the post operative period. We have multiple single/dual/three parameter monitors that will monitor each of the above parameters in combination as required. 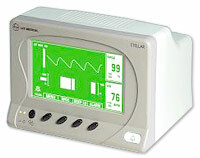 An essential cardiac monitoring unit with a facility to give a cardiac "shock" in certain emergency situations. These are used for continuous electronic monitoring of the babies heart beat either in pregnancy or in labour. It is used to carry out the Non Stress Test as well as in labour it picks up problems with the oxygen supply to the baby very early so the delivery can be safely carried out.